With my co-host, the fabulous Barry from Cinematic Catharsis and the return from the grave for the blogathon now with a wee twist. This another of my favourite blogathons, and this time back with a vengeance. 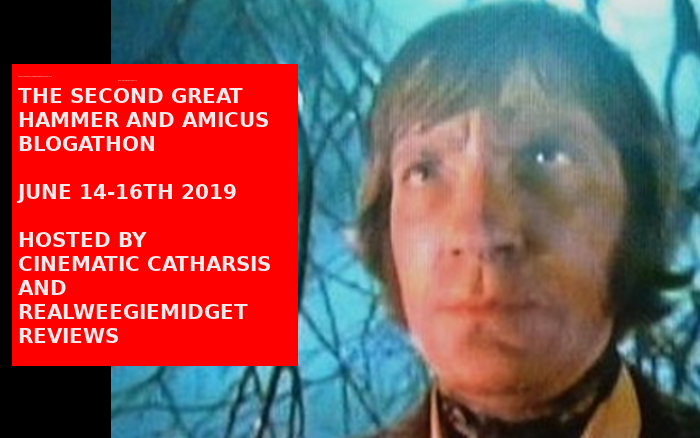 The first one of these blogathons was just last year, where we celebrated both Hammer and Amicus movies. Both days an amazing turnout. Just before you non-Horror fans turn away at the mere mention of these film studios, these film companies also dabbled with other movie genres. And of course all these genres are welcome in our blogathon. So I’m asking you to join me and my wonderful co-host Barry from Cinematic Catharsis with any of their great work from way back then to the present day. Barry’s post can be found if you CLICK HERE. 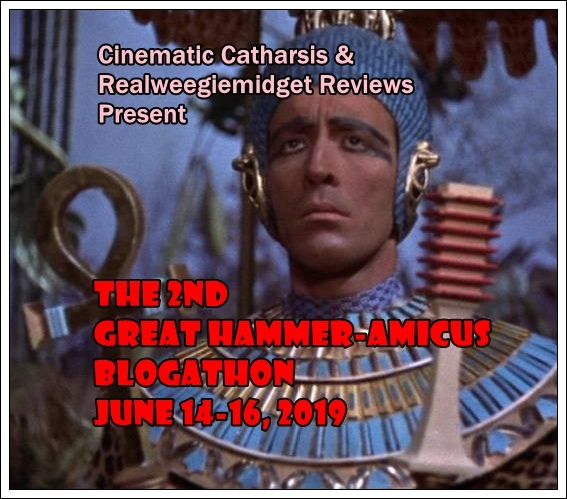 The all important dates for this blogathon are June 14-16 2019. You can review any of their films or TV work. Alternatively. you may write about their related books, their histories, their stars or even your favourite moments… its up to you. If you want to check out a topic of review we are both happy to advise you, if it’s acceptable for this tribute. The rules this year however, have a wee twist… this being with one review per movie. So I urge you to sign up before your favourite or review choice is taken… As once its gone its gone. Check Barry’s page out as well before requesting your review choice (due to the crazy difference in our time zones (he’s in the USA and I’m in Finland). And to hopefully prevent disappointment over missing out, please send us your FIRST and SECOND choices! You can review ANY of their films or TV shows. Or if you want to review books or topics about these film companies, that’s ok with us too. We will allow just the one review for each topic be it movie, book or TV Show. You can only write on those previously mentioned, if they are in a list or retrospective review. But you can of course mention other films in your post. Review choices can be added as a comment on this page or you can contact me on my Contact Me page – please add the name and URL of your blog along with your choice of movie / book or TV choice. Or you can send me a Direct Message on Twitter. Or if you want to write about these topics (eg actors involved), tell me what your topic will be. We won’t accept posts which are uncomplimentary or disrespectful to these talents and their works. Add your Twitter username so we can promote your post. You can also add podcasts on their work, but only if you send me the podcast link by my Contact Me page. Only original, never before published posts will be accepted. Send your link to your post link /podcast / video to Barry or me on the days of the blogathon. Note we will be publishing all the links on both my WordPress blog and Barry’s Blogspot one on each day of the blogathon. And these are my and Barry’s choices… and remember you don’t have to do one of each, you can do as many or as little as you like from each…. Barry at Cinematic Catharsis – The Land that Time Forgot (1974) for Amicus and Moon Zero Two (1969) for Hammer. 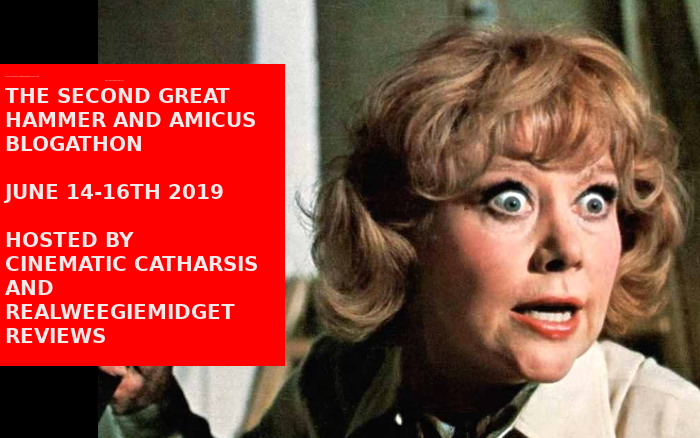 and lists of those Amicus productions HERE and more on the Hammer productions HERE and the films HERE. Hope you hear from you soon… and remember you are also welcome to join my April blogathon on Michael Caine HERE. How marvelous!! Could I write about The Hound of the Baskervilles (1959), with Peter Cushing and Christopher Lee? Certainly, so happy you joining in! Looking forward to this one. Hey Gill. I will take “The Witches” ( 1966 ) with Joan Fontaine, if its still available? That would be great, fab to have you on board. Will tell Barry.! No problem, fab to have you join us. Love you to join the one on Michael Caine if you’ve the time. I will be abroad when the Michael Caine Blogathon is running. We will be cruising to Hawaii, so I won’t have internet access or very little if I do. Yay, glad you joining us! Adding you now. Added you now with both. Looking forward to your posts. I’m glad this blogathon is back! I want to write about Doctor Morelle (also known as Doctor Morelle: the case of the missing heiress), from 1949. Adding you to the line up now, great to have you on board Le! Hello, Gill! Would love to write about Hammer’s “Straight on till Morning” (1972) if it’s not taken. Much appreciated! Fantastic you joining us Ken, always love your posts. Not to worry, was just surprised I hadn’t heard from you with your usual trio of goodies. Can I do Amicus’ “Doctor Who and The Daleks” & “The Dalek Invasion Of Earth 2150AD”? Sure thing, great to have you join us. Will add you now. I love this blogathon and always look forward to it. May I do Captain Kronos, Vampire Hunter please? Thanks! Can I do The Mind of Mr. Soames for The Stop Button? Me too, happy to be working with you for a second year. Yay! I’m so excited for this, Gill! May I please write about Vampire Circus and Twins of Evil? Always fabulous to have you on board Gabriela! !